Here at Anastasia Date, we’re here to change that. This recipe is courtesy of Olga at Olga’s Flavor Factory, and these Russian honey spice cookies are sure to impress your honey. Keep things both sweet and a little spicy with these tasty treats. Olga is from Belarus and now resides in the US, where she shares the incredible recipes she learned from her mother, like these delicious Pryaniki. Serves: 54 cookies—they freeze really well! First, dissolve the instant coffee in the water in a medium saucepan, then add the butter, sugar and honey. Bring the mixture to a boil and then reduce heat to medium, cooking and stirring until the sugar dissolves and the butter melts. Remove from heat, pour into a large bowl, and cool for 10-15 minutes. Add all the spices: vanilla, allspice, nutmeg and anise. Whisk in the eggs, the baking soda dissolved in vinegar, and baking powder. It’ll fizz a little when you mix it, that’s OK! Mix in the flour with a large wooden spoon until it’s all moistened, then cover the batter with plastic wrap or a kitchen towel and set aside at room temperature for at least 4 hours, or overnight. Preheat the oven to 325 degrees Fahrenheit, and line a rimmed baking sheet with parchment paper. Use a 1 Tbsp measuring spoon to scoop up batter and roll in your palms to shape it into balls. When you place them on the baking sheet, be sure to leave room around each cookie, because they will expand in the oven. Bake in the preheated oven for 20-25 minutes. Once the cookies are baked and have cooled off, whisk the powdered sugar and the milk together in a large bowl to make the glaze. Dip the cooled cookies into the glaze, letting the excess run off, and set the glazed cookies on a rack or parchment paper to dry. When the glaze is dry, you can flip the cookies over and glaze the other side as well if you want to add an extra bit of sweetness! 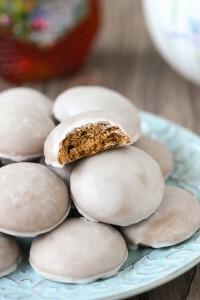 Move quickly when you’re glazing the cookies, because the glaze will thicken and dry up and become harder to work with. Just add a bit more milk, a splash at a time while whisking, to thin it out if it hardens. Store the cookies at room temperature in a sealed container.